Guthrie Ontario - Town Sign - Highway 11 going south. Town sign of Guthrie Ontario, taken while travelling southbound on Highway 11. Population and limts sign for Severn Township in Ontario. Taken while travelling along Highway 11 Southbound. Population on sign is 12500. 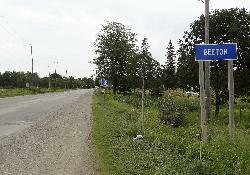 The town of Beeton Ontario boundary sign, travelling eastbound on County Road 1. 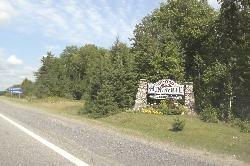 Town of Huntsville Welcome Sign travelling along Highway 11 North. Huntsville Population Sign while travelling on Highway 11 North, 19km south of Huntsville city centre. Simcoe County welcome sign. Taken while travelling along Highway 11 southbound entering Severn Township. Population and limts sign for Severn Township in Ontario. Taken while travelling along Highway 11 Southbound. Population on sign is 12000. Town limits of Ardtrea Ontario. Taken from Highway 11 southbound. Located in Severn Township. Town limits sign for Cumberland Beach in Severn Township Ontario.